ST GEORGE, UT / ACCESSWIRE / May 10, 2016 / J5 Tactical, An American Flashlight manufacturer today announced that they have sold over 1 million of their powerful LED flashlights. The J5 Tactical V1-Pro is their most popular model which has generated enormous praise on social media and other online feedback sites. Originally designed as a "Tactical Flashlight" with a super bright 300 Lumen beam, many customers are buying them to use as an everyday flashlight as well. With over 2500 positive reviews on Amazon alone, it's not hard to see why this unit is quick becoming America's most trusted flashlight. Built to last, the J5 V1Pro is made with a super high grade aluminum casing, anti-slip grip with a convenient belt clip for extra portability and runs of just a single AA battery. TJ Johnson, Founder of J5 Tactical said "We just wanted to create a reliable, powerful flashlight that doesn't flicker and fail when you want to use it, like so many others do." "The J5 is a superior and exceptional light with unbelievably competitive pricing, and a raving fan base. When these three attributes all line up you have a win/win situation for the customer, the vendor, and the manufacturer. And that's exactly what the J5 has done." Continued Johnson. If the feedback on their Facebook and Amazon page is anything to go by, then it would seem they have struck the right note. "Uh..Awesome! Small. Sturdy. Extremely bright. I expect I'll buy more to keep in my car and briefcase." Added Mark Bubar just days ago. 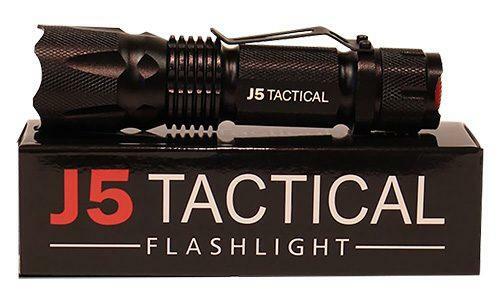 J5 Tactical flashlights are available through their own websites, Amazon.com and some selected retailers around America.